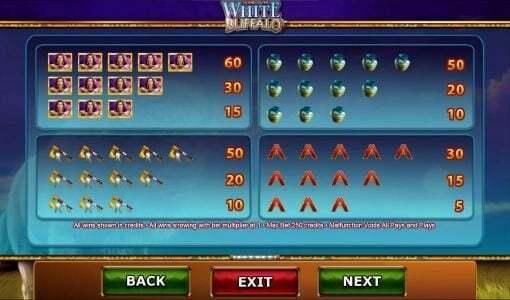 Legend of the White Buffalo is a 5 game reel slot with a top payout of 125,000x using the western indian heritage theme. 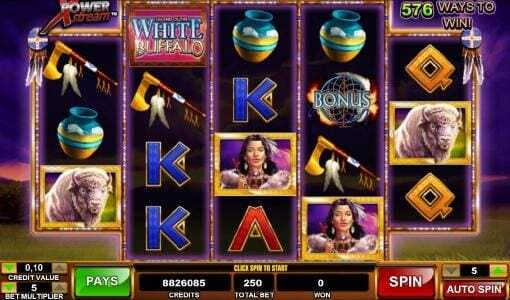 Legend of the White Buffalo Slots has not been reviewed yet, be the first to rate this slot. 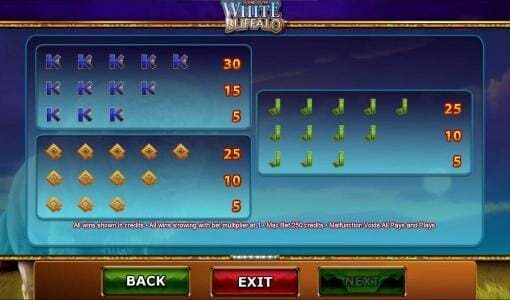 Legend of the White Buffalo is a 5 reel, 576 payline video slot developed by Cryptologic. Players are taken to the wide open plains of North America where buffalos used to roam and where kings of the land. 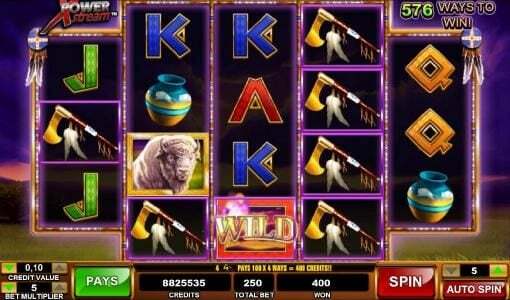 In this slot you find features such as free spins, wilds and scatters. Its top jackpot is a respectable 125,000 coins! 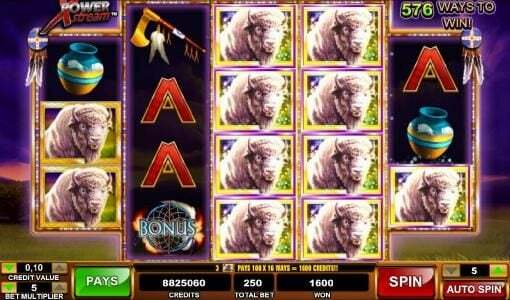 The Legend of the White Buffalo takes place in the North American Plains, players will see large trees & mountains located in the background. The most impressive aspect of this background is the purple & orange sunset that covers this grass field. The symbols which are seen on the reels help make this theme more believable as they were common in Indian times. Weapons, Vases, Buffalo, A Stunning Indian Woman, Game Feature Symbols, Themed Poker Symbols & many others appear. Players will also find that the wagering selection available in this CryptoLogic based pokie is beyond that of any normal slot as it caters to low rolling & high rolling players alike. The maximum bet available to be made is $250.00. The Wild appears only on the second, third and fourth reels. When players land on one of the wild symbols it’ll activate the wild feature which in return will substitute all symbols that aren’t the bonus symbols from their positions. In return new symbols take up those positions & allow for extra winning combinations to be activated along the reels. The Bonus Symbols activated the free spins feature. This symbol just as the wild only appears on the second, third and fourth reels. Once this feature is activated players will trigger eight free spins. 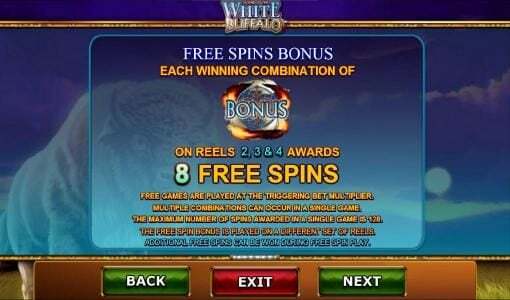 The best thing about this feature is that any Bonus symbols that appear during those free spins rewards players with another eight free spins & any winning combination triggered during this feature will be multiplied by a players triggering bet, meaning a 250x multiplier can be in play. 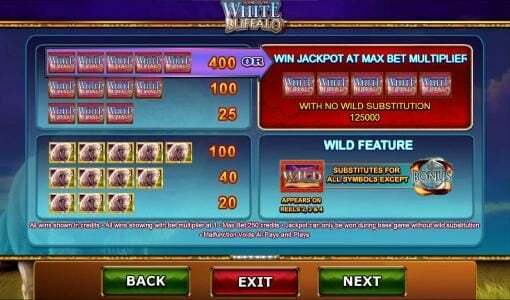 Players can win up to a maximum of 128 Free Spins as well. Legend of the White Buffalo is a great game with a cool theme. 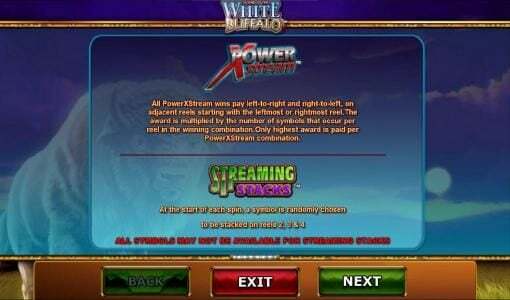 The Xpower stream is a real positive aspect to this Slot as are its features and graphics. The 125,000 jackpot is also a nice touch worth challenging yourself to win.